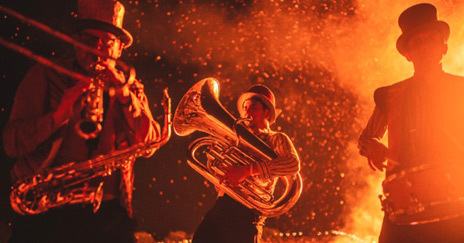 Tongues of Fire was founded by saxophonist and composer Tim Hill in 2004, and features musicians drawn from the worlds of free jazz, brass bands, contemporary classical, theatre and samba. The band was created to play both in the street and concert hall and to make music that can be both adventurous and accessible. Tim comes from a long line of Buckinghamshire Baptists going back to the English civil war and the band’s name was inspired by ideas of radical, accessible, engaged and inspirational music and a fiery spirituality. Tongues of Fire are also Tim’s favourite bean, inspiring another kind of hot breath. Recent gigs include, Hull Freedom Festival, Exeter Rugby World Cup celebrations, the Station to Station festival at the Barbican, Wilderness Festival, Marsden Jazz Festival and many more.